It was another extraordinary week in Mexico City. We ventured into the forest, found unexpected and superb art, and discovered that no matter how many tacos we eat, we cannot get enough, they are so delicious here. We only have a few days left in this vibrant, colorful and very alive city and it’s a bit bittersweet. But we plan to make the most of it. We celebrated Constitution Day and Chinese New Year in China Town which is next to Alameda Central. Alameda Central is Mexico’s oldest municipal park created in 1592! We discovered the Palacio de Bellas Artes, the most important cultural center in Mexico. It’s a stunning building which hosts some of the most notable events in music, dance, theatre, opera and literature as well as exhibiting paintings, sculptures, and photography. The pretty spectacular Palacio de Bellas Artes. This week also started our Street Food and Street Art video shoots. 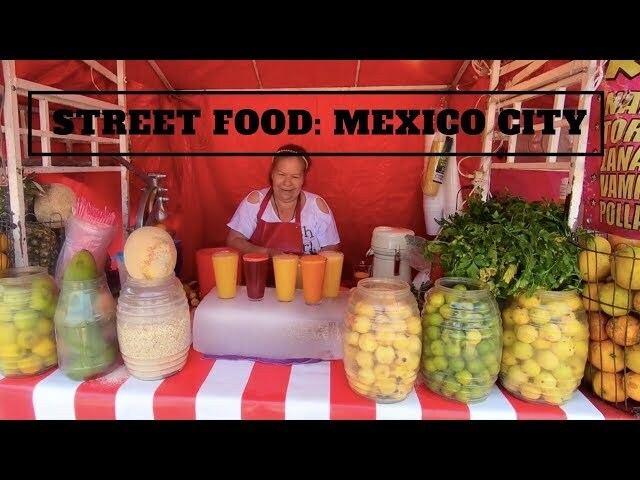 The street food is as good or better than what you get in restaurants and it’s what we’ve been eating all this week (and probably next week too). Other than a Chilaquiles, we have pretty much lived off the carts that dot the corners all around our place. Speaking of our place we filmed a little neighborhood tour because we really lucked out in terms of location. The markets, foods, and sites within a few minutes walk of our Airbnb. It certainly pays to do your homework. Street art is all over the city and much of it is quite good. We like how unexpected it is; turn a corner and in front of you is a beautiful mural. The colors and talent on display are so inspiring. It really brings a street alive. Most spectacularly, we spent an incredible day at the majestic Pierda Harada Monarch Butterfly Reserve. It is indescribable what it felt like to watch hundreds of thousands of butterflies roosting in clumps on a tree and then scatter about as a wind came through. It was simply magical. It was a special trip for Kim. Butterflies have such a strong meaning for her and I think I caught her tearing up a time or two. Me, a million close friends, and a butterfly. I know we said we were mailing your postcards last week, but in the end, I lied. We had some trouble finding the post office, but we persevered and postcards have been mailed – I promise. We will finish the Street Art, Street Food, and Neighborhood videos as well as take in a few more tourist sites in the City. We want to spend some time in Coyoacan, where Frida Kahlo‘s house is and visit the Anthropology Museum. There is still a lot to do, but of course, we also must work. Boo. Next week, we’ll be writing to you from Belize! We are really going to miss CDMX but we can’t wait to get to the beach. Since last week, we posted two videos: Beach Life and Destination Debrief: China, our very last video from our very first country on our 60×60 journey. Next up we have some videos from our time in Flagstaff and Las Vegas. This week we launched our Patreon page, it’s a community designed to support creators. Many people asked how they could support our work. We discussed several ideas and debated for a LONG time about what asking for support would look like. It is crazy to think that by making our dream of traveling the world come true, we would make other people so happy. We have absolutely loved the community that sprouted up as a result of this journey. We have three different tiers of support, all with a “perk.” Check it out. To be honest, there is not a whole lot we can offer you in way of thanks for your support. Just know that we are grateful. We have a PayPal link and some affiliate links of products we use for anyone looking for other ways to show support.